Made from ultralight, superbreathable 100% polyester (60% recycled) with 50+ UPF sun protection and Polygiene® permanent odor control, our technical Sunshade Hoody helps you stay cool and covered in hot-weather conditions. 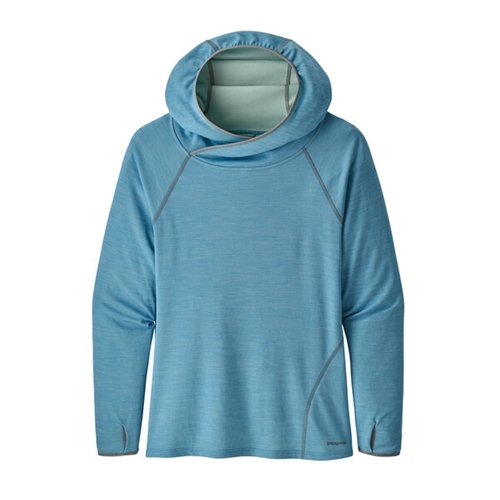 Providing full upper-body coverage with a cool, airy feel and a looser cut for ease of movement, this flattering hooded sun shirt fits beautifully and works hard to keep you comfortable through the hottest days on the tropical flats. The hood shields the head and neck and fits easily over a baseball cap; the wrap-over design at the neck provides better airflow while shading the throat. A hidden zippered pocket on the lower-left hem holds small essentials, and thumb holes on the cuffs keep the sleeves over your hands for additional protection. * Inseam will vary depending on style; when lengths are offered, "regular" is 32 and "long" is 34, unless otherwise noted. I like how smooth and lightweight this sun shirt is. The hoody fits nicely, not tight. I like how tall the neck is in the front too so my neck gets coverage as well, yet it's not so tall that I can't breathe. It's a nice weight so it's not so hot in the summer time.